Sarah Breedlove, better known by her moniker Madam C.J. Walker, was born in 1867 to former slaves, two years after slavery was abolished. Her perseverance, dedication, and grit allowed her to overcome many obstacles and transform herself from an uneducated washerwoman, earning $1.50 a day, to one of the first women in America to become a self-made millionaire. Madam C.J. Walker was very focused on advancing the quality of life for African Americans in her area. She funded educational scholarships for African-American children, gave donations to homes for the elderly as well as the YMCA, and gave money to organizations focused on improving the lives of African Americans, such as the National Association for the Advancement of Colored People and the National Conference on Lynching. Her beauty parlor students also spread her philosophy of "cleanliness and loveliness," as a means of advancing the status of African Americans. When Walker died in 1919 of a kidney disease, her net worth was around $600,000, which made her one of the richest businesswomen in America. She left behind a legacy of hard work and success, in a time when triumph was extremely difficult for both African Americans and women. She overcame the hardships and all the obstacles placed in front of her, and lived a happy and successful life. "Madam C.J. Walker." Biography.com. February 27, 2018. https://www.biography.com/people/madam-cj-walker-9522174. "Madam C.J. Walker, Hair Product Tin, 1925." Smithsonian Insider. June 07, 2016. https://insider.si.edu/2011/03/albert-einsteins-pipe-c-1948. 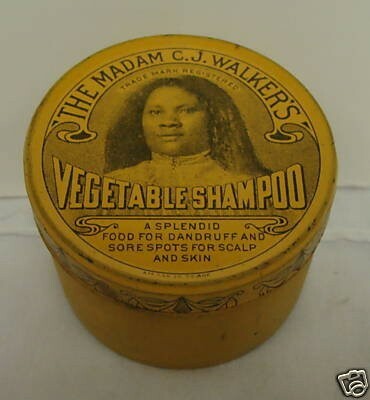 "Madam Walker's Wonderful Hair Grower." Madam C. J. Walker. June 30, 2011. https://madamcjwalker.wordpress.com/2011/06/29/madam-walkers-wonderful-hair-grower/.